I've been pretty unwell for a while now and it seems to have triggered a miriad of severe food intolerances. As a result I've a new found respect for anyone dealing with limitations to their diet. I try to always find the positive in a situation so rather than focusing on what I can't have I've been focusing on what I can. To start with this was more about creating enough meals from the very limited ingredients I could have to get by. Now I'm getting more used to it and given that Christmas is around the corner I decided it was time to get back baking in the kitchen. My scales were getting lonely! I love all things winter and spice I wanted to try and make some Christmas tree decorations that I could eat if I wished, intolerances and all! Sometimes 'free from' recipes look to unusual ingredients and substitutions which lead to a frankly odd result. 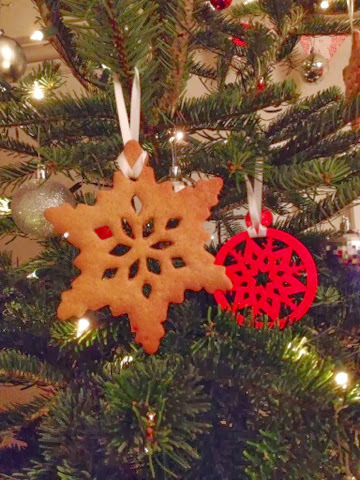 Many standard recipes can be amended with a few of my favourite ingredients so relying on my favourite margarine, Stork (which is dairy free) and favourite gluten free flour, Doves Farm I set about creating a gluten free, dairy free biscuit that would be firm enough to hold up when hung from ribbon on the tree. I then added a touch of the warming spices of winter. The evocative smell of the biscuits whilst they were baking was just divine. They filled the kitchen with the smell of Christmas and warmed my soul. They look wonderful on the tree and would make a lovely present placed lovingly in a beautiful gift box! 1/2 tsp mixed spice or all-spice. 1. Start by thoroughly mixing together the flour, sugar, spices and baking powder. Top tip, if your soft brown sugar goes hard and lumpy either pop a slice of apple in to help it soften or warm in the microwave for a few seconds. 2. Using your finger tips rub the Stork margarine into the dry ingredients to create a bread crumb texture. Alternatively the pulse function of your food processor will achieve the same result. 3. Mix in one egg at a time. If the mixture is a little dry add a splash of water. 4. Roll out the dough until it is about 1/2cm deep and use your favourite cookie cutter cut out your shapes. 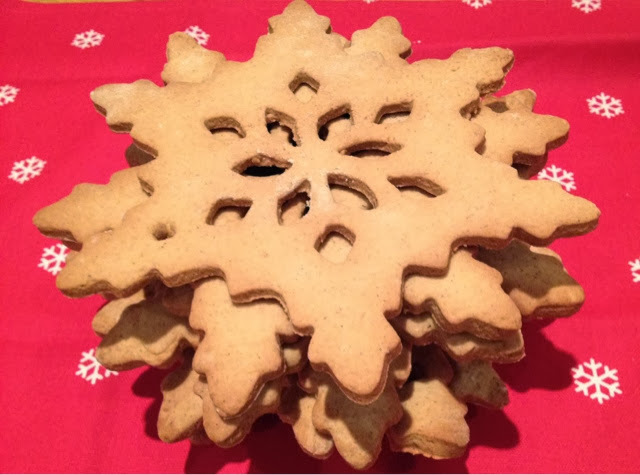 I used this intricate snowflake cutter I picked up in a 20% off event at Marks and Spencer. 5. Using a chopstick or small round object make a hole in each cookie so that once cooked you can thread ribbon through. 6. Bake at 150C for about 20-22minutes until golden brown and crisp on both sides. Remove from the oven and carefully transfer to a wire rack to cool. 7. Once cool you can decorate them by piping Royal icing and using your choice of sprinkles however as my tree is fairly rustic and the cutter is already quite intricate I wanted to leave them plain.